Hungry Opera Machine’s Original Opera, “Flour, Salt and Moonbeams” Reviewed in the Oregonian: (you can also go to their site and read it there). © 2015 OregonLive.com. All rights reserved. A Mafioso guy walks into a diner. Stop me if you’ve heard this one. The Mafioso guy wants corned-beef hash. The cook only makes tortillas. Ladies, and gentlemen, we have an opera. A Gypsy jazz opera, courtesy of Eric Stern – he of Vagabond Opera, shaved head and vaudevillian beard. And radical ideas about opera. Stern has a new opera, a hybrid of high classical, low comedy, fluid jazz and boho sensibility. “Flour, Salt and Moonbeams” plays at Alberta Rose, March 27 and 28. He also has a brand-new opera company. It’s called Hungry Opera Machine and it springs from the same mind that created Vagabond, but the two companies are different. 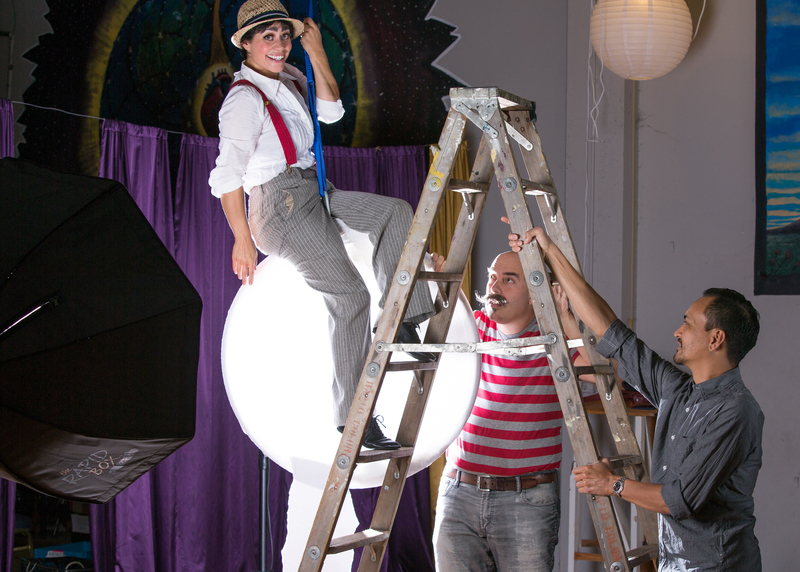 Vagabond is a band that tours the country with cabaret, jazz, klezmer, bohemian and Balkan music. Hungry Opera stays home and brings opera to the people, says the man who crossed the country in his 20s, singing and playing accordion in the streets. And who paid for his first Portland apartment by busking outside Pastaworks on Hawthorne Boulevard in 1992. Stern loves opera, he says, having sung roles in “La Boheme” and such in Delaware and Pennsylvania. He just wants to make it more accessible. “I want this to be more radical, weave opera into the community more than it is,” he says. That means operas in English, with a broader approach to music that includes jazz, folk and contemporary, and a dramatic style that goes back to Commedia Dell’Art. Portland is a place to do that, he says. “The musical air is a little freer to breathe here.” Which is good, because Stern is one of those guys who can do anything. Write, compose, arrange, sing, act, play instruments you’ve never heard of. Consider the origin of “Flour, Salt and Moonbeams,” dubbed “A Gypsy Jazz Opera.” Last summer, Stern invited a bunch of people into his backyard to preview the show. About 100 folks packed into his north Portland yard, sitting on tarps, blankets, straw and cushions. He began with a singalong of “A Roving,” the jaunty sea chanty. “We all have a voice,” he says. “They weren’t afraid of their own voices.” In November, the new opera came inside for a preview in Mississippi Pizza Pub, and now it’s ready for prime time, with four singers and four instrumentalists who cross stylistic boundaries themselves. The plot is simple. A Charlie Chaplin-type cook (Annie Rosen, Dell’Arte International School of Physical Theater) has a limited repertoire of dishes: tortillas only. When the Mafioso (Ian Ramirez, Portland Opera resident artist) with a broken heart bites into one, he’s in rapture. Hilarity ensues with a potty-mouthed waitress (soprano Dru Rutledge, Portland Opera) and a tightwad restaurant manager (Noah Mickens, Ringmaster for Portland’s Wanderlust Circus). A silent film breaks out, followed by a fullblown Puccini-like aria. Or maybe it’s the other way around. 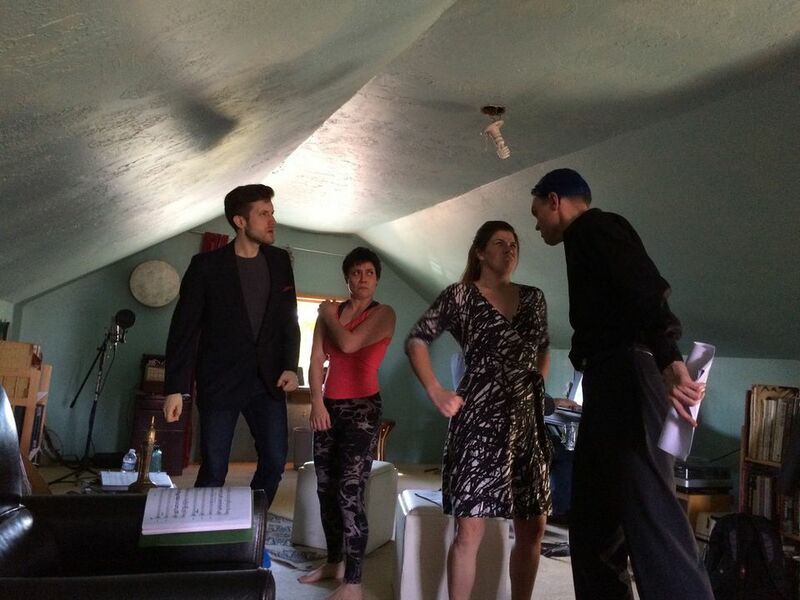 During a recent rehearsal in Stern’s “garret,” the second-floor of his house, singers moved through their scenes while Stern accompanied them on an electronic keyboard. He wrote both the music and text for the show.